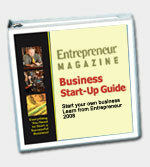 BusinessMart.com strongly recommends Entrepreneur Magazine's Clothing Store Start-Up Guide. For more information read below. To purchase this book click on BUY NOW. "Shop 'til you drop" is arguably one of America's favorite mantras, whether we're shopping for Nikes, jeans or a new favorite T-shirt. If you have a passion for fashion, like the idea of helping others and are willing to work long hours--even on weekends--a retail clothing store may be the business you've been searching for. And if you really want to see what your life will be like, there's even a section that walks you through a typical day--from hours of operation and pricing to payment processing and returns. If you get goosebumps when you find that perfect pair of shoes, leaf through the fat fall issue of Vogue or splurge on a cozy cashmere sweater, it's time to investigate a business in which looking good never goes out of style. Make your dream come true and order your guide today!